Francesco Molinari became the first home winner of the Italian Open since 1980 when he captured the title with a massive 23-under-par total of 265. The 23-year-old began his final round tied with England's Benn Barham but pulled away with an eagle at the first. Molinari holed a seven-foot birdie putt at the last to finish with a 65 and was immediately drenched in champagne. Swede Jarmo Sandelin and Dane Anders Hansen tied for second while Barham faded to settle for a share of 16th. Warrington's Phillip Archer and Welshman Bradley Dredge were the best of the British contingent, as they finished tied on 16 under for sixth spot. Molinari showed remarkable poise to shake off the pressure coming from the loud and enthusiastic galleries and the chasing duo of Sandelin and Hansen. Sandelin drew level when a deft chip left him with an easy birdie-putt at the 15th. However, he could not retain his charge as he bogeyed the next while Molinari did not drop a single shot. The Italian birdied the 13th and added another on the par-five 15th. 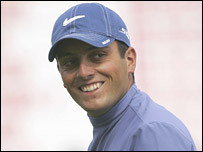 Molinari's success in Milan was not only a public one but one he could savour personally too. The Italian Open victory represents his first major title after his rookie season in 2005 - the same year as his brother Edoardo won the US Amateur title.